Mountain Hiking Holidays Blog: Home Again! Hiked up to Marmot Pass in the Buckhorn Wilderness of Olympic National Forest on a family backpacking trip last weekend. The last time I had been at Marmot Pass was about 27 years ago when I was a seasonal backcountry ranger for Olympic National Park. 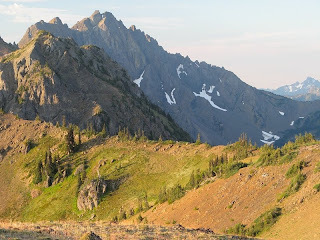 Since then, I've hiked in beautiful mountains all over the world, but I realized standing on the high ridge of Marmot Pass that the Olympics are still a favorite. Over the past quarter century, many things have changed, but the beauty of the Olympic Mountains endures! Breathing the yellow cedar scented air of the Olympic high country, it felt good to be "home" again!